As part of the Mongol Conquest Campaign that I outlined here the other day, the next step in the planning is based around two areas – some background information on the armies as well as looking at the available figures for each of them. As I mentioned, I am building this little collection based around Conn Iggulden’s books as a start, with a bit of history tossed in for more flavour. I am loosely following Iggulden’s books and these were written based on the content of the Secret History of the Mongols. This is still the main source for information of the Mongols of this period. I’ll build a bibliography later, as well as some book reviews but note that copies of the Secret History are expensive. As readers of Thomo’s Hole will realise too, I spent some time working in Mongolia and I will freely admit that was one of the happiest times of my life. The people are, mostly, really very nice and the countryside is just gorgeous. It was also good to have travelled parts of the Mongolian countryside as well as Kazakhstan and northern China to get a feel for the country in that part of the world. 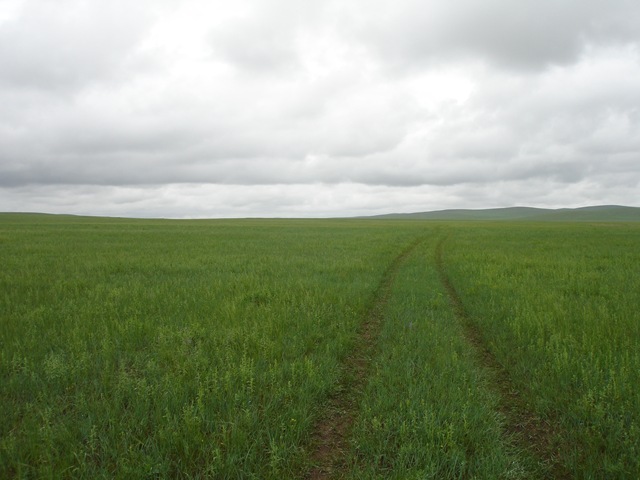 The picture to the left is the steppes in the east of Mongolia. That is the main road in that area as well that you can see. I’ll cover the terrain of Mongolia in a later article. The Mongols are a collection of tribes inhabiting the area to the north of China and up into Siberia. The wargame list for this presented in the DBA rules however covers not just the Mongols but also the Tatars, Naiman, Merkit (all mentioned in Iggulden’s books), Onggud and Kereyit. 10 x 2 Light Horse – the rest of the tribe – 10 bases of them. At least now there is the start of a second dimension. For both these forces the camp will consist of a base with a Ger (yurt) and a camp follower element of some women and children ((Women were by and large hardy and tough and also had a vested interest in protecting the camp especially as this was a nomadic society and and without permanent settlements – to lose your protection in winter was to die on steppes where the temperature could fall as low as –50 degrees Celsius)) – if I can find some suitable figures dressed in deel ((this is the Mongolian traditional dress and is similar for both men and women)). The next step in the Mongol part of this is to indentify some suitable figures which I will do in a separate post. I will also start to look at the other armies for this chapter of the project. Hi Thomo, for the Secret History, search instead for the Folio Society edition using 'Chinggis Khan' as your search phrase on bookfinder.com. Should get you something more affordable.